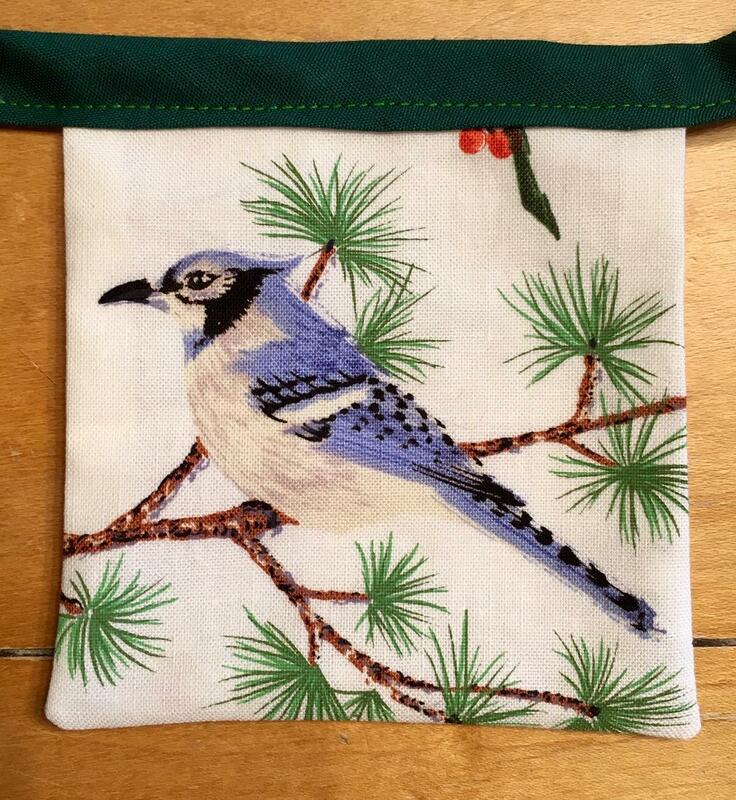 When Anne put out the call for her most recent Handmade Joy Exchange, I raised my hand and said, "I'm in!" Anne sent me the name and address of a woman in India. I checked out Prerna's Instagram account and then I waited for the muse. I must confess, held by the grip of our steady winter here in Vermont, it took a while to become inspired. As I was looking through my fabric stash for another project, my eye was caught by some fabric I have had for years. Prerna has a lovely way with a paintbrush, and she produces gorgeous paintings of birds native to India. When I spotted this bird fabric and then looked out the window at the grey and bleak landscape, I was stuck by the contrast! 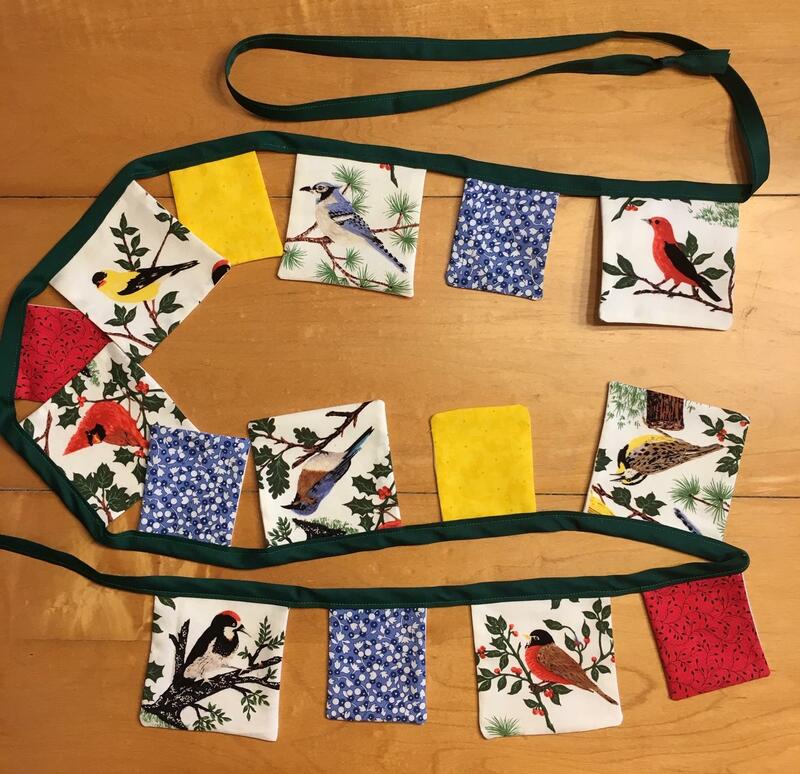 Imagine a bunting stitched of birds from North America, slung across a window in verdant India? Bingo. My project was underway. I do hope it has brought a bit of joy to Prerna! And look at what arrived in my mailbox! 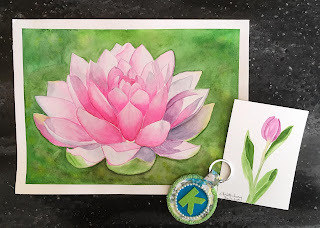 This beautiful watercolor painting came from Chris Mechery, who also lives in India. Chris included a monogrammed keyring and a sweet tulip card. 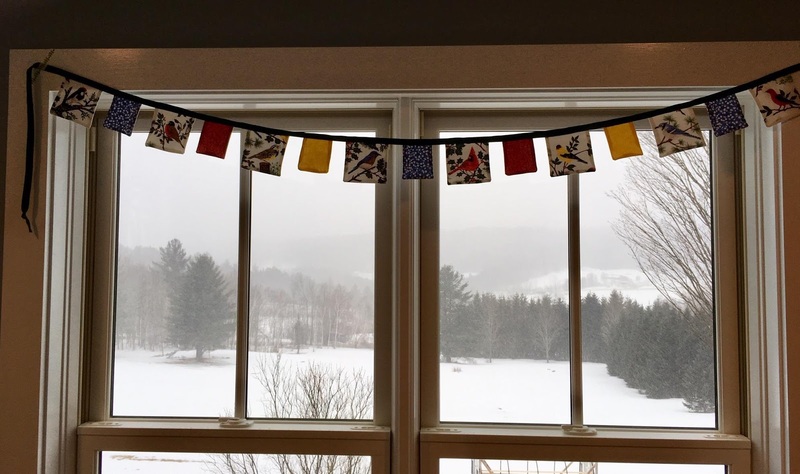 I must tell you, friends, that this bolt of color was most welcomed here in snowy Vermont! You can find more of Chris's inspiring art here. This morning when I learned of the grim terrorist attack in New Zealand, I felt overwhelmed with frustration, anger, bitterness and grief. It followed me to the gym, where I worked some of it out. And then I turned my attention, instead, to the amazing youth around the world, striking to bring attention to global climate change, all under the leadership of Greta Thunberg who calls herself " a 16 year old climate activist with Asperger's". 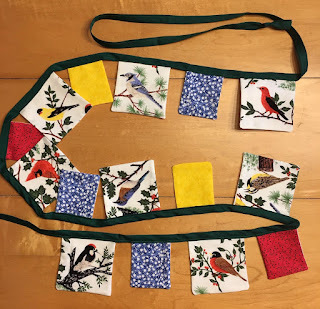 And now this...Anne's account of her Handmade Joy Exchange. I will find hope and joy wherever I can these days. Thank you Anne, for getting us organized once again. Thank you for joining the Exchange again this year, Karen. I am so glad that you were able to find some creative inspiration in the dreariness of winter and that a pop of color out of your mailbox was able to bring you some joy. I'm so grateful to know you, my friend. still sewing, 'cause there's no sowing yet!